This Touch Switch circuit uses a 555 timer as its core component. 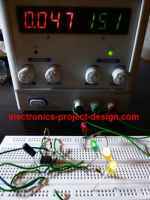 The timer operation is configured as a monostable or one shot multivibrator in that once it is triggered, it will output a fixed pulse and remain there for a period which is a function of the time constant t= R2 X E1. In this circuit, the pulse width generated is about 4-4.5 seconds. The trigger is activated by touching the touch terminal. 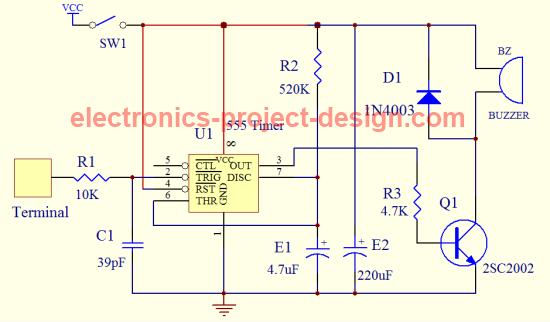 In this circuit, the output from pin 3 of 555 timer is used to turn ON the NPN transistor Q1. Q1 will in turn activate a buzzer for about 4-4.5 seconds after which it will go OFF. If you need a longer delay, increase the values of R2 and E1. Similarly if a shorter duration is required, reduce the values of R2 and E1. The Vcc used is 9V from a battery. For safety reason, it is important that you do not use any power supply from mains unless the power supply is designed with isolating transformer that comforms to the safety standard such as UL. Improperly designed power supply may cause shock to you when you touch the terminal hence it is always better to use a dry cell battery for this project. Besides the buzzer, you can modify the circuit to on a series of light emitting diodes once the terminal is touched.